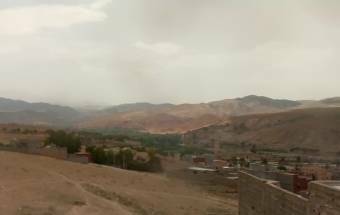 Webcam Tahanaout: View over Tahanaout - View of the Mosque and the village at the foot of the High Atlas chain. Taghazout: Beach View, 118.4 mi. Mirhleft: Les 3 Chameaux, 174.5 mi. Ifrane: Al Akhawayn University, 223.8 mi. Taza: Place Aherrach, 301.4 mi. Tangier: HD Stream over Tangier, 329.5 mi. Conil de la Frontera: Playa de la Fontanilla, 356 mi. Vejer de la Frontera: View over Vejer de la Frontera, 356.6 mi. This webcam Tahanaout with the theme City Views was added on June 17, 2016 and is operated by Skyline Webcams. It got 101 visitors since then. Shouldn't this webcam work or should the link be wrong please report that here. You can add this webcam here to myCams.